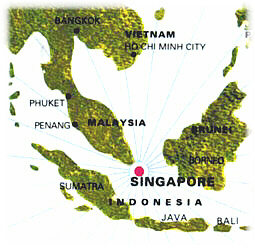 Located at the crossroads of South East Asia, Singapore is a natural cruise destination. Already one of the world's busiest ports because of its strategic location on the main trade routes of Asia, Singapore is also the focus for the developing tourist trade for the surrounding countries such as Malaysia, Indonesia, Thailand and Brunei. Served by a major international airport, Singapore is not only a cruise destination but is also expanding as a cruise terminal. Royal Caribbean based its Sun Viking at Singapore later last year. Star Cruise is already well established at the port with its Superstar Gemini, Star Aquarius, Megastar Aries and Megastar Taurus. 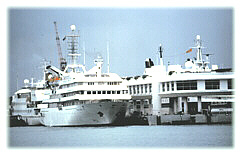 Renaissance Cruises also operate a passenger vessel from Singapore. The figures demonstrate the upturn in cruise traffic at Singapore. In 1995, 54 cruise ships made calls at Singapore (11 maiden calls) bringing 933,249 passengers, a 32.7% increase from the previous year. Much of this is the result of the Port of Singapore opening its ultra-modern Cruise Centre four years ago. These dedicated facilities close to the centre of Singapore can handle three passenger ships at a time. These cruise ships cover the whole spectrum of cruise itineraries from round the world voyages to cruises to nowhere. Many are short 3 to 4 day cruises to neighbouring countries. For passengers arriving at Singapore there is an enormous range of attractions and on a one day stop, the options have to be narrowed down. 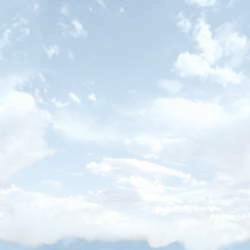 They vary from experiencing the cultural background of Singapore, a variety of theme parks, enjoying the culinary delights, and taking part in the major Singapore experience of shopping. 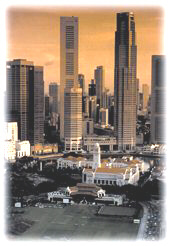 Singapore has a wide range of ethnic populations which is reflected in the city. A walk around Chinatown reflects on the Chinese history. Here are traditional Chinese street scenes set amongst the towering skyscrapers of the business area. Further out is Geylang which is traditionally the home of the Muslim population, and the remaining fishing villages out on the northern coasts still reflect the traditional coastal way of life. The British ruled Singapore for around 150 years and their contribution can be seen in the fine public buildings, fronted by the cricket and rugby pitches. For a true taste of colonial Singapore a visit to the finely restored Raffles Hotel with its courtyard and Long Bar are a must. 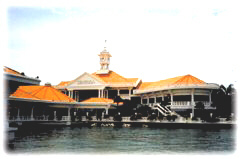 Sentosa Island just across from the Cruise Centre is the main home of Singapore's theme parks. Travel is by cable car, ferry or road. Here you can sample the history of Singapore, the Butterfly Park, the Underwater World and Volcano Land. After these shows there is the prospect of cooling off at Fantasy Island, a spectacular water theme park. Outside Sentosa, Singapore Zoo with its newly established Night Safari is one of the best in the world, whilst more specialised attractions are the Crocodile Park and the Tiger Balm Gardens. Singapore offers probably the widest range of eating delights of anywhere in the world. The newly restored Boat Quay and Conyer Quay may be sanitised compared with their bustling past, but they now offer a range of excellent eating spots alongside the Singapore River. For the tourist looking for more local fare, the hawker centres and food malls are a must. Here, under one roof are 20 or 30 stalls selling every type of ethnic food. They are clean, they are cheap and the bustle and excitement make them unique to Singapore. Every July Singapore hosts a food festival where a Food Village is established to offer eating delights from all over the world. Singapore is a country of festivals, many of them reflecting on ethnic or religious pasts. The range of festivals means that at most times of the year the lights are going up and street parades and festivals are taking place. Singapore's motto is "shop till you drop". Here there are probably more air-conditioned shopping malls than in any other part of the world. 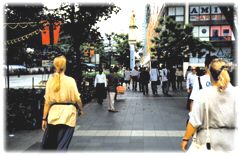 Orchard Street is the centre of the shopping district, but new malls are springing up away from this centre, many of them focussing on specific products or styles. Shopping in Singapore may not be the cheapest in the world, but the authorities have controlled the shops to the extent that quality is guaranteed and buyers can be sure they are getting what they pay for. Whilst walking is one of the best ways to see Singapore, transport is cheap and easy. Taxis are some of the cheapest in the world and the MRT is an easy way to avoid the traffic jams. Buses reach to the parts this mass transit system doesn't reach. Singapore is safe enough to walk the streets at night and the extensive planting of trees and shrubs gives a garden like atmosphere to this bustling city. Singapore may sound like one gigantic theme park, but the reality is that it is a city with much to explore and discover. To get to the heart of the city it is best to walk the streets or ride the subway. This is where the diversity of race and style becomes evident. Sampling the food is another way of experiencing the diversity of Singapore which has an area of little over 500 square miles, yet is one of the main importing and exporting countries of the world. Singapore thrives on trade yet is building an enviable reputation as a tourist centre.